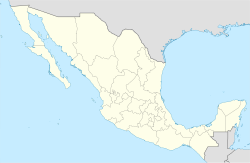 Cancún (Spaingie pronunciation: [kaŋˈkun]) is a ceety in sootheastren Mexico, locatit on the sootheast coast o the Yucatán Peninsula in the Mexican state o Quintana Roo. It is a major warld-renained tourist destination, as well as bein the seat o the municipality o Benito Juárez. The ceety is locatit on the Caribbean Sea, an is ane o the eastrenmaist pynts in Mexico. Cancún is locatit just north o Mexico's Caribbean coast resort band kent as the Riviera Maya. ↑ "OMT concede premio excelencia a la promoción turística de Cancún (México)" (in Spaingie). ES: El Economista. 3 February 2007. Retrieved June 17, 2011. This page wis last eeditit on 11 Mairch 2018, at 07:47.